For twenty years the name of the Tecnomar boatyard in Viareggio has been linked to the image of elegant, very fast almost offshore motorboats, in disguise of cruise boats; obviously in this period philosophy and size have changed, going from 12-15 metres at the outset to 26 and over of today and combining the pleasure of high performance with that of comfort, too. The search for speed is no longer the only element ruling the choice of a boat: meeting the needs of clients who are increasingly better informed and mature, and those of an international market that now finds in the large opens one of the driving elements of the "Italian style", Tecnomar has evolved in direction of a high quality of shipboard services, and this apart from the normal sporting qualities, . 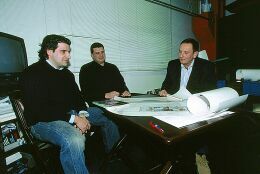 The company team, Faliero Sarti, Managing Director, his brother Paolo, Roberto and Maurizio Zappelli, respectively project and product manager, with the support of architect Luca Dini, exterior and interior stylist, are preparing to move - together with the study centre and the three present separate production centres in the Viareggio area - to the new premises in Massa: 18,000 square metres to be used for construction but also for shelter, which will make it possible to face the more and more impelling requests for these splendid sporty boats. Now let's hear from Roberto Zappelli, naval planner, who summarises for us the boatyard's present situation and future projects. How have the clients' needs evolved over the years and what is your production strategy at present? In the beginning, in 1986, both due to market demand and construction choice, we produced boats between 12 and 15 metres in length, where speed performance was the most important factor, without much attention being paid to ergonomics and comfort of the interiors (you can't be comfortable on an offshore! ); then, having come through the recession, at the beginning of the nineties, unscathed and through an opposite trend period with little boats in steel too, we arrived at the present line of beautiful, high performance boats, that are however also comfortable and luxurious. A link with our roots still exists, if you look closely and this is the TB 546, a sharp 16 metres blade of a boa that flies at 65 knots, but it now has internal spaces that are liveable: now you can even be comfortable on an offshore! The move to the new premises in Massa will permit, apart from faster production lines, necessary given the current positive trend of the open market, thinking about larger boats (one is already in progress), still following the philosophy of the Boatyard, in other words completely custom. It will also mean we can offer shelter and end of season maintenance. Which basic models can have the various customisation options? As well as the already mentioned TB 546, there are three basic models: Silkcut, Velvet and Madras. 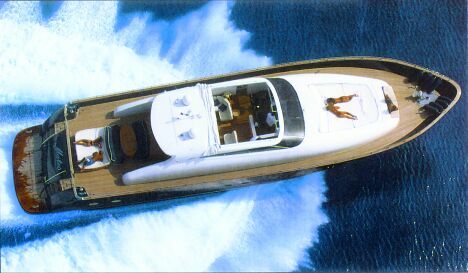 The latter is an open and the first two are coupés, of the 20 metre Fast Cruisers in the lower length range built by us, they offer breathtaking performance, a cruising speed of over 55 knots and excellent liveability that is not detached from the elegance of a real motoryacht: to this end the collaboration that already existed in '95, with architect Luca Dini from Florence is a determining factor. The Madras and the Velvet are also built in a larger size, 24 and 26 metres, and this is the current trend of our boatyard; if the cruising speed has dropped, now around 35 knots, the number of possible external-internal lay-outs has increased exponentially, with a view to providing the client with his "own" boat; made to measure, you could say. Incidentally, the names that recall soft velvets, silk and exotic madras, fairly unusual in a sailing world that tends to compare almost every gliding boat with aggressive, carnivore entities, are an elegant legacy of the Sarti family, important traditional Tuscan fabric industrialists. What is meant by "completely custom" and what are the limits to intervention? Basically, we develop the owner's idea basing on our experience; practically a project office with, incidentally, an adjacent boatyard and its twenty years of business. Custom means the confirmation of the owner's ego mediated, without losing sight of safety and seaworthiness, with our aesthetic canons and the strict building criteria provided for by the maximum RINA and EC class . There is ample margin for intervention, from the construction materials to the engines/transmission and obviously all the fittings on deck and below deck; all our hulls are in fibreglass, while for requests for hulls in metal, steel or alloy we call into play our partnership with the Rossi Boatyard in Viareggio. For example a small craft has been produced in steel, a Madras 26 was requested in aluminium, yet another with three engines and a single large suite below deck; the number of the cabins can vary from one to 5/6, as can the size of the living area, and within limits, also the position of the deck-house. Performance, weights and centre of gravity are then recalculated and the engines are adapted with relative reduction ratios, never losing sight of the cornerstones of Tecnomar construction, that is, the ability to update each part, as well as ease of disassembly and access to each part of the boat, to facilitate both maintenance/repairs and any "upgrading" of engines and reducers. Special tactics, deriving from offshore competitions, are adopted for speedy loading/unloading of large engines; the engine on the Madras 26 of a well-known sports personality seized up last summer in Sardinia: just four days were all that was necessary for him to take to the seas again with a new engine! With what criteria is the boat's performance chosen? Performance can take either speed or economy into account, in other words how much can a boat possibly give or with an eye on running expenses; we go in fact from the exuberant three engine Madras 26 to the Velvet 26 with two 1400 HP engines, that at 32 knots cruising speed is not absolutely fast, but it is very fast for that kind of boat with that consumption. Even transmission plays its part in running costs: at these speeds shafting with immersed propellers that requires less crew for manoeuvres still gives an acceptable result. The Arnesons with surface propellers are to be preferred in the case of real speed performances, above all on the Velvet and Madras 26, while on the 24 metres traditional propellers give good results. Any previews regarding your flagship, the new 35 metres? The fast fibreglass small craft, custom-built, recently launched is the forerunner of the new creature: a boat with classic, absolutely clean lines; lower deck, main deck and flybridge, with a monohedric gliding bottom; a simplicity that is in fact an opposite trend, for a copybook style with interiors that can obviously be entirely personalised. Number one is already under construction in Massa with launching planned for Spring 2004. ...any plans in the pipeline? ...I'd call it a study rather than a plan, in which we are investing time and resources: considering that on a boat a part, I'd say even half of the power produced is lost due to the most varied resistance and friction, we are trying out all kinds of recuperation methods, from wind power to hydro power and energy from the sun, to recuperate as much of the lost energy as possible, favoured to some extent by materials and technology that were once unthinkable: this is the contribution that we can make, even with a luxury consumption product like the superyachts, in the mandatory direction of global energy saving. In the boatyard we also met the designer of all Tecnomar hulls, the architect Luca Dini; his signature seals boats that today are among the most prestigious in Italian production, from the Admirals to C.N. Lavagna, to the megayachts of the C.P. Navi. We asked him what philosophy is behind the present guidelines of the Madras 26 and the Velvet 26, the most requested boats at the moment. When I started with Tecnomar, in '95, speed was queen, even if it meant doing without comfort. Then market demand led to an evolution in the quality of life on board: interiors with a good head height everywhere, the minimum number of drops possible, lots of privacy for everyone, spacious exteriors, in the living areas but also in the guest quarters, which were once very limited, and galleys that are really functional; to sum it all up, the daily outing for a swim can become a comfortable cruise for several days, without the worry of which restaurant to choose each evening for a decent dinner. Safety is also important: gunwale protection everywhere, like a real motoryacht, as well as clean navigation, permits the sons and daughters of the young owner to move about on board without problems and makes manoeuvres easier. All this, together with the by now super tested bottom is the philosophy of the Madras and the Velvet 26. Whereas, for aesthetics we have maintained a sporty touch, different in the two models, but with a sober elegance, that does not become tiring. What are the differences between the Madras 26 and the Velvet 26? The main differences concern the type of superstructure adopted: the Madras 26 is a pure open, with only the roll bar and a tilt separating the passengers from the sky. Then the closed saloon, liveable in the event of bad weather, when it's cold or in the evening, is on the lower deck where inevitably the view is limited to that offered by the portholes; whereas the Velvet, with a rigid enclosed deck-house towards the stern with its four curved glass doors, creates a sheltered airy living area, moving the centre of gravity of life on board onto the main deck. In both models the waterlines and the technical and lay-out solutions are the same, always with a view to maximum adaptability to the individual requests of the owner. ...a comparison with the world of motorcars? I always shun very showy style exaggerations, typical of certain cars from the land of the Rising Sun, that express a lack of personal style and quickly become tiring; I also avoid the striking, if masterly, super sporty architecture of the Ferraris; I would say that the closest you could get to my boats is the powerful, elegant and sober curves of a great Porsche.